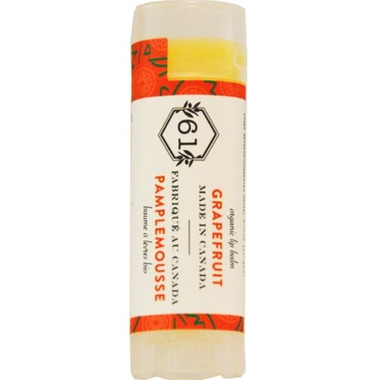 Crate 61 Organics Grapefruit Lip Balm has a combination of organic pink grapefruit, sweet orange and bergamot essential oils gives this lip balm a fresh fruity flavor. I love the smell, which is just like a grapefruit, but I feel as if it's not as moisturizing as the By Night lip balm, which I also have. I am addicted to this lip balm. Really nice scent, goes on like silk and I feel immediate relief once applied. I have several of these. Very nice. Smells delicious, like chocolate lol. Love crate 61 lip balms, I have 3 different ones!! They are so smooth compared to other natural beeswax based lipbalms. Plus they smell great! This lip balm is the only one that works for me. I tried so many other natural and regular ones and most left my lips drier. It smells great too. Definitely worth a try. Stay away from this product! Doesn't smell like grapefruit, has an expired, "off" kind of smell, consistency is very waxy & uncomfortable on the lips. I've already opened this product, so I'm not able to return it. Disappointed customer! Love this product!! Smells great and works with moisturizing your lips. This line is great. I feel comfortable using it on my lips because it isn't full of horrible chemicals. And the price point is amazing, considering what natural products usually cost. Bonus...the grapefruit one actually tastes like chocolate orange...my favourite. Love the smell. Love the feel on my lips. Love it! This is my 3rd time purchasing this lip balm. Love the texture, smell , and my lips stay moisturized for a long time. Highly recommended! You canâ€™t find a better lip balm and the price is awesome. Every flavour has been great and Iâ€™ve tried most. Glad I found this lip balm. All natural, truly moisturizing, and lasts on lips. The flavours in this line are very nice.